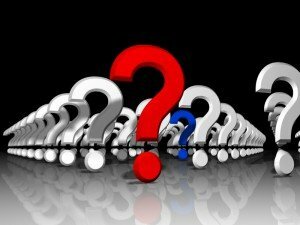 Questions to ask when designing your security system. OK….you’ve selected the company you feel offers the best value for your situation. Now it’s time to design your system. There are a number of variables to take into consideration when designing your security system. Will you be arming the system when you are home, away or both? Do you have pets? How many and how big are they? Are they relegated to specific areas or do they have free rein of the property? What life safety and environment protection would you like included in your system? Are there any possessions or sensitive items or papers which might require additional protection? Are you interested in home automation features and creating a “smart home”? Do you want to include cameras in your system? Would you like the ability to view the cameras and control your system remotely? What is your budget for your system? The last consideration will likely impact many of the features that you will include in your system. The most common components are listed below. 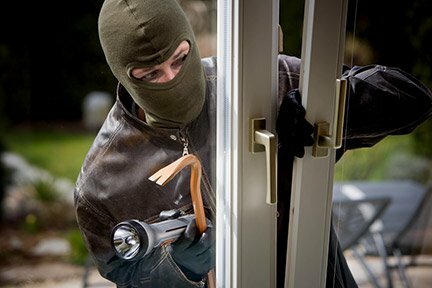 When designing your security system, at a minimum, I always recommend protecting all of your doors and using a motion detector to be used as a backup if entry is gained through a window. A minimum of one smoke detector will ensure that, in the event of a fire, a signal is sent if there is no time, or you are unable to contact the fire department. Each of the above considerations will be dealt with in greater detail in the blog-or you can get additional information and guidance here. 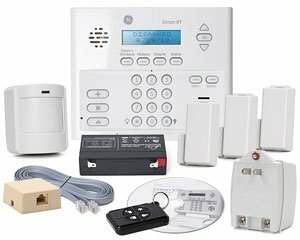 There are a wide array of components that can interface and be monitored wit today’s sophisticated alarm system. A comprehensive protection package might contain any or all of the following components. The control panel is the ‘brain’ of your home security systems. It communicates with sensors and detectors throughout the house. It usually has a keypad that enables you to arm, disarm and activate your alarm system. Home security systems activate an internal siren to alert you of the presence of an intruder, or other alarm situation. Life safety sensors can activate alarms to warn your family of a number of potentially dangerous situations. 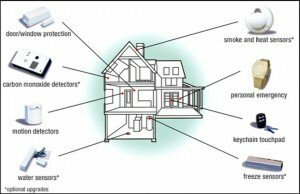 A comprehensive system can detect carbon monoxide, fire, flood or other critical systems as well. Many systems also include chime functions and voice annunciation to describe the nature and location of an alarm signal. The foundation of a home home security system, these sensors create a magnetic contact at the most vulnerable points of intrusion-doors and accessible first story windows. They are comprised of 2 parts- a transmitter and a magnet. When a door or window is opened, the magnetic contact is broken and the transmitter sends a signal back to the control panel. Motion detectors can generally detect motion from 40 to 80 feet away and can be connected to your home alarm system or to a security camera. They work on passive infra-red technology, detecting changes in heat signatures, and often offer “pet immunity” to screen out small animals. Glass Break Sensors detect either the sounds of breaking glass, or sense the impact-or both. These are enrolled in the system as perimeter protection and are active in either the “stay” or away” mode. CCTV cameras are used for surveillance and to capture images and video. Surveillance cameras can be either Analog or Digital and can transmit signals either by cable or wirelessly for observation and can be stored locally on a DVR (digital video recorder) or offsite on a web server. IP/network cameras are similar to analog/digital cameras, but have an IP address assigned to them. Specially designed motion sensors, contacts and security cameras can also be used to activate alarms and monitor outside of the home. They are designed to withstand the elements and be less susceptible to false alarms. Unlike the average ionization home smoke detectors, these smoke detectors combine photoelectric technology with heat sensors. This provides reliable protection for any type of fire and is less susceptible to false alarms. These are used in areas where excessive smoke might be an issue – garages, basements, kitchens and around wood stoves. They detect a rapid rise in temperature. CO sensors detect the presence of Carbon Monoxide. Often used in bedrooms above garages and where propane is burned. Sensors that can detect flooding and low temperature can protect your home from freezing pipes and flooding. These are typically placed in the coldest area of the home and areas most effected by potential flooding. Recent advances in technology enables the alarm system to control lights, thermostats, door locks and a host of other devices. The entire system can be controlled remotely on your phone, tablet or computer with apps, anywhere in the world where there is internet access. In areas where there is reliable cellular service, a system can be equipped with cellular communication as either a primary or back up means of communication. This eliminates the potential of a system being defeated by cutting the phone or cable lines. Is the “Basic Package” enough? When designing your home security system you will ultimately need to establish priorities and a budget to be able to formulate a security strategy which will meet your needs. 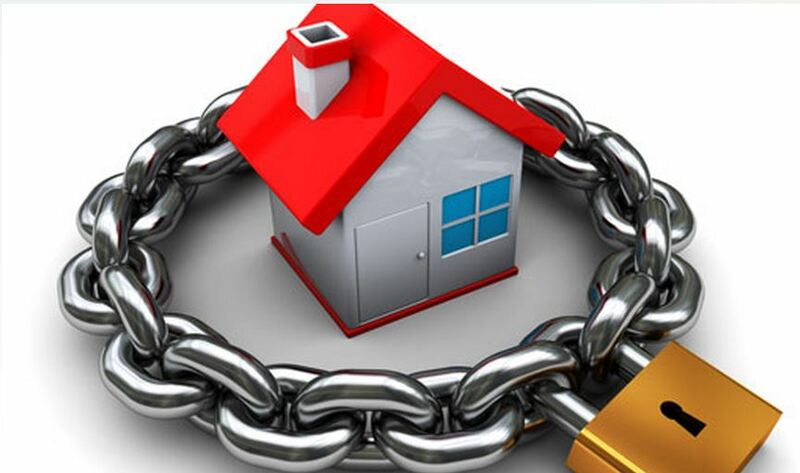 It is helpful to think in terms of layers of protection when constructing your security system. A comprehensive security system may incorporate a combination of perimeter protection, interior protection, life safety and home automation components. Each of these topics are addressed in greater detail individually in my posts. But, one thing to keep in mind is that some protection is better than no protection. Most systems are fully expandable up to 40+ zones of protection. For some it may make sense to have along term strategy which includes upgrades. Frankly, it is rare that a basic system package will provide complete protection. The sound of breaking glass being shattered by the blow of a Stanley ballpein hammer pierces the night- awakening you from the deep slumber of a midsummer’s night. You sit bolt upright, cradling your pillow to your chest in fear. Silence…for a moment….and the sounds of crickets chirping on a balmy August night. Then…the faint crunching of broken glass against tile -made by size 10.5 Timberlands as the intruder climbs through the sliding glass door, making his way stealthily across the kitchen floor. 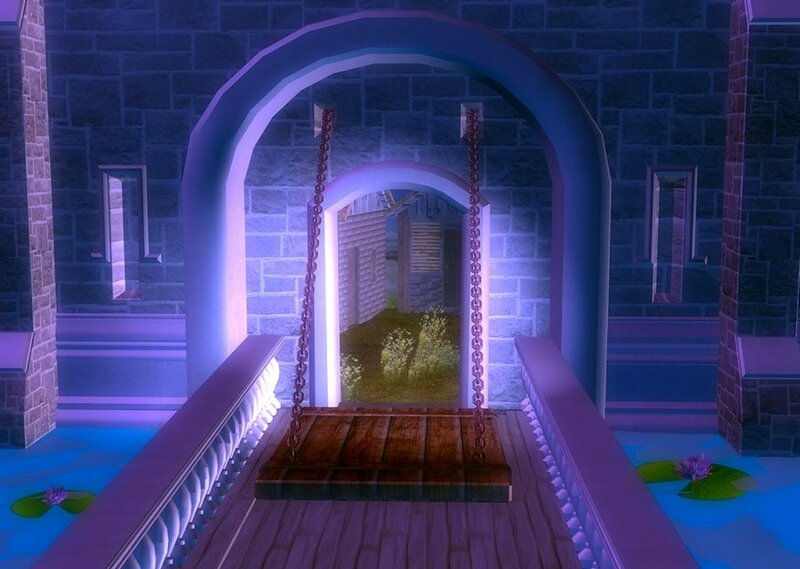 Your heart is pounding as you hold your breath, struggling to hear the faintest of sounds as the footsteps have gone silent. Then….a barely discernible creak on the loose floorboard beneath the tattered carpet runners on your newly refinished hardwood hallway floor….that leads to your new 1st floor master suite. Your mind is racing…and you curse yourself for not having updated your Security Master 2000 when you renovated your home. Why didn’t you listen to the security specialist when he pointed out that your motion detectors would not be active in the “stay mode”? Shaking yourself back into reality, you slowly reach under the bed, with trembling hands, for the 32” Louisville Slugger you kept since your sandlot baseball days in elementary school. Fumbling past the dust bunnies, old books and unworn shoes…you finally grasp the reassuring piece of ash wood with your now sweaty palms. No shrill 105 db sirens to scare off the intruder….no automatic calls to a trained professional dispatcher at the monitoring center…no reassuring police sirens approaching. Just you…your Louisville Slugger and an unknown assailant. OK….a bit melodramatic…but, it does illustrate the importance of carefully considering all your options when planning and designing your home security system. For true “peace of mind” it may make sense to look beyond the pre-packaged 3 doors and a motion detector basic, entry-level system and carefully consider some of the additional components necessary to create a more comprehensive protection package. Some companies, such as Protect America, make it more affordable to obtain a more comprehensive system be eliminating up front equipment charges and providing more comprehensive security packages with $0 up front costs. Whichever company you feel is best, I would encourage you NOT to procrastinate, put away that Louisville Slugger and to take whatever steps you feel are appropriate to protect your home and family…and get the peace of mind you deserve! Please feel free to offer your comments,feedback or experiences on designing your security system below.